Most often users come with infected PC’s with no (or outdated AV-software) to computer repair stores. The used methodology considers this situation: an already infected system that needs to be cleaned. The test was performed in autumn 2011 under Microsoft Windows XP Professional SP3. This test focuses only on the malware removal/cleaning capabilities, therefore all selected/used samples were samples that the tested Anti-Virus products were able to detect. It has nothing to do with detection rates or protection capabilities. Of course, if an Anti-Virus is not able to detect the malware, it is also not able to remove it. The main question was if the products are able to successfully remove malware from an already infected/compromised system. 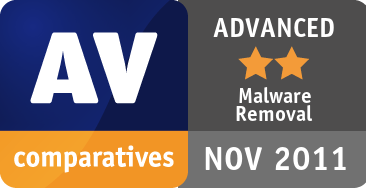 The test report is aimed to normal/typical home users and not Administrators or advanced users that may have the knowledge for advanced/manual malware removal/repair procedures. The sample must have been prevalent (according to metadata on exact hashes) in the order of at least thousands (and at least hundreds of thousands for their malware family / behavior they represent) of instances AND seen in the field on at least two PC’s of our local customers in 2011. 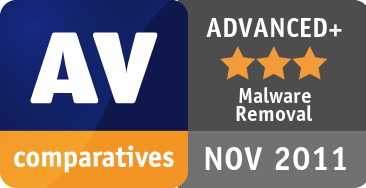 The malware must be non-destructive (in other words, it should be possible for an Anti-Virus product to “repair/clean” the system without the need of replacing windows system files etc.) and show common malware behaviors (in order to represent also behaviors observed by many other malware samples). Due to that, the selected malware is representative of a very large amount of other samples which show similar behavior and system changes. To avoid providing information to malware authors who could be potentially useful for them to improve their creations, this public report contains only general information about the malware/leftovers, without any technical instructions/details. Sophos is a corporate product. Due to that, it may not restore e.g. some registry entries by design, as in a managed environment, some of these settings may be enforced centrally by system administrators. In case of home user products, such settings should be fixed as part of the malware removal process (or at least the possibility to fix them should be given in the products).